If you are taking care of an elderly parent or a physically or mentally challenged relative, who is taking care of your money? Being a caregiver can have serious financial implications. For example, time spent on giving assistance and running to hospital appointments can affect the caregiver’s income. Often, caregivers have to cut down their hours or only work part time. Sometimes they have to pass up promotions and raises that would require more of their time so that they can continue to be available to their loved ones. But as expenses continue to mount up for health care and running the home, how are these families expected to live? This question becomes more relevant as people tend to live longer these days, and more adult children end up as caregivers for their elderly parents than in the past. 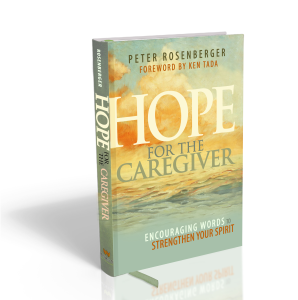 According to caregiver, author of Hope for the Caregiver, and podcaster Peter Rosenberger, over 65 million Americans are currently looking after loved ones and this number is set to increase. When I interviewed Peter, who looks after his wife, car crash survivor Gracie, he painted a detailed picture of the issues that many caregivers face. Many times, caregivers are so involved with looking after their loved ones that they neglect some of these areas with disastrous results. One financial step often neglected is life insurance, which many caregivers seem to forget about. If you are looking after any dependents, whether it is your own children, spouse, or an elderly parent, you need to make sure that they are well provided for in the event that something happens to you. In our discussion, Peter stressed the need to find a reliable financial planner who cares about your situation. There are times when leaving a loved one too much money may actually be bad for them because they may lose certain benefits and assistance, such as Medicaid, if they suddenly become too wealthy. For this reason, consult with a financial planner to make sure that if everyone benefits in the best way possible both during your lifetime and afterwards. My interview with Peter was extremely inspiring. To watch the video of our discussion, click here.